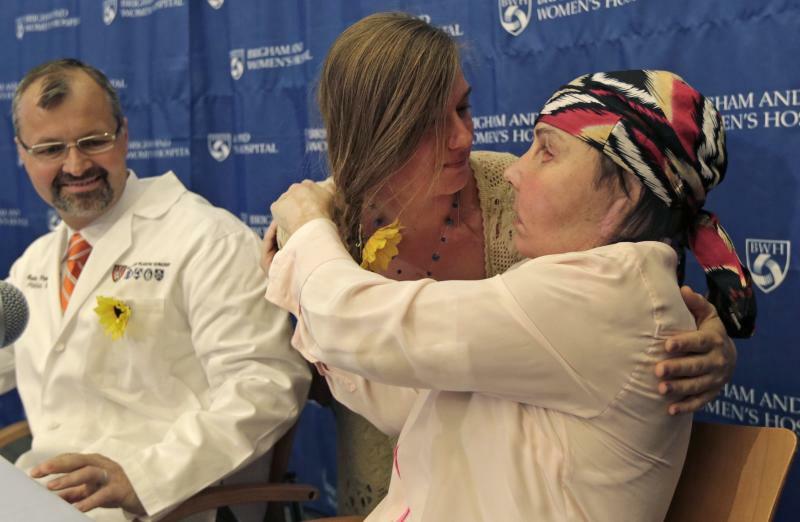 BOSTON (AP) — Loved ones knew it was her at the hospital when they saw her teeth. Carmen Blandin Tarleton's face was unrecognizable after the lye attack, burned away in the frenzy of an estranged husband's rage. 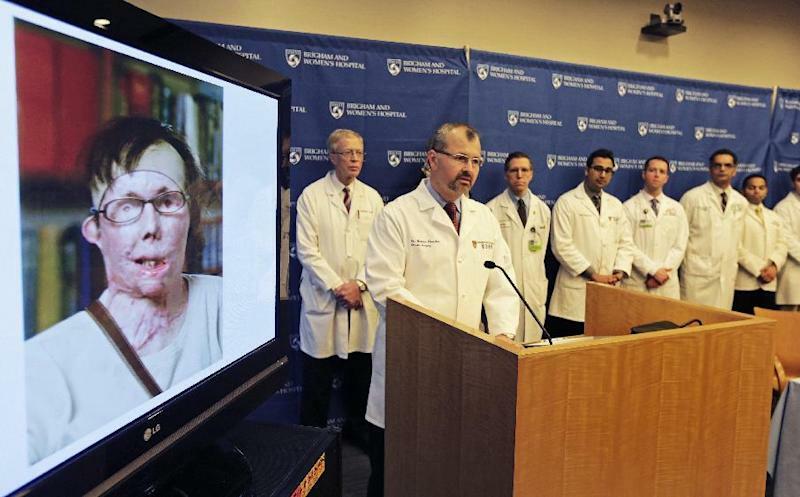 Doctors at Brigham & Women's Hospital in Boston said at a Wednesday news conference that the 44-year-old's surgery included transplanting a female donor's facial skin to Tarleton's neck, nose and lips, along with facial muscles, arteries and nerves. "I know how truly blessed I am, and will have such a nice reflection in the mirror to remind myself what selfless really is," Tarleton wrote on her blog Wednesday. Tarleton's sister, Kesstan Blandin, shared a statement from Tarleton that said she felt "really good and happy." "I want to convey to the donor's family what a great gift they have given to me," the statement said. "...I feel strong and I am confident that I have the strength to deal with whatever comes my way." The latest surgery took 15 hours and included a team of more than 30 medical professionals. The lead surgeon, Bohdan Pomahac, called her injuries among the worst he's seen in his career. "Carmen is a fighter," the doctor said. "And fight she did." 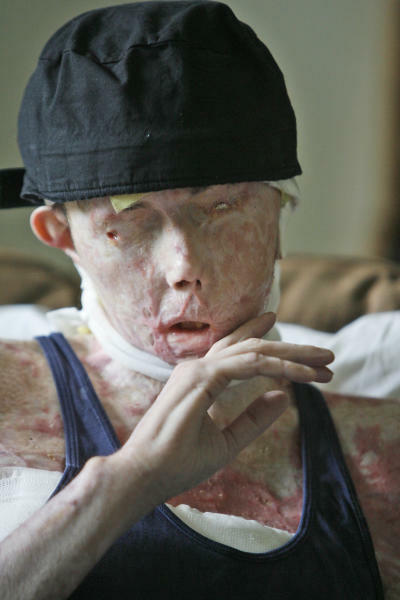 Pomahac's team has performed five facial transplants at the hospital. He said his team's latest patient is recovering well and is in great spirits as she works to get stronger. Before the transplant, Tarleton drooled constantly because of scar tissue in her mouth. She also couldn't turn her head from side to side or lift her chin. Pomahac said Tarleton was pleased when she saw her new face for the first time. Her appearance will not match that of the late donor's face, he said. "I think she looks amazing, but I'm biased," the surgeon said with a smile. The donor's family wants to remain anonymous now, but released a statement through a regional donor bank saying that her spirit would live on through Tarleton and three other organ recipients. In 2009, Tarleton's now ex-husband Herbert Rodgers pleaded guilty to maiming her in exchange for a prison sentence of at least 30 years. Police previously said Rodgers believed his wife was seeing another man and went to her house to attack him. Tarleton mistook the intruder for a burglar at first and told him he could have whatever he wanted. Then Rodgers launched into a fury, fracturing one of Tarleton's eye sockets and breaking her arm with the bat. When police arrived, the brunette's heart-shaped face already was distorted, her skin turning brown. She was trying to crawl into a shower to wash away the chemical. But now, the mother of two daughters talks about forgiveness and has a newly-published book called "Overcome: Burned, Blinded and Blessed." "Forgiveness is about helping ourselves, not the people who hurt us," read an image on a website Wednesday that promotes her book.